No-one in his right mind would be surprised that the new rulers of Libya’s streets want to mete out justice to remnants of Col. Muammar Gaddafi’s army, upon whom they can lay their hands. The resistance put up in Tripoli by pro-Gaddafi snipers was intense enough to frighten the anti-Gaddafi forces into imposing summary justice on their would-be murderers. A group of 500 Ghanaians who managed to arrive back in March, told harrying stories of how difficult life had been for them even then – when Tripoli had not seen the sort of fighting that Benghazi and other towns had experienced. They said they had left about 10,000 of their compatriots behind. The stories of brutality against blacks that have appeared on Channel Four News and CNN, as well as in The Independent newspapaper, make it imperative for the NATO leaders to impress upon the National Transitional Council (NTC) that the suppression of racist hysteria against blacks must count as one of their topmost priorities. Of course, it is understandable that that they should be currently pre-occupied with consolidating their administration. But people killed by racists cannot be recalled back to life. So, if they do not do something extraordinary to saving innocent black workers, they will do permanent damage to Libyan diplomacy in Africa. I call on the NATO leaders to remember that South Africa voted with them to adopt UN Security Council Resolution 1973, which formed the basis of their intervention in Libya. But already, South Africa and many other African Union (AU) members are yet to recognise the NTC. And the Nigerian government, which has recognised the NTC, has come under criticism for jumping the gun. This is because many Nigerians are among the hapless blacks seen on television, who fear that they will be liquidated by armed Libyan racists. The irony of the situation is that under Col. Gaddafi’s regime, black Africans in Libya did not enjoy quite the life of roses that some Libyans projected unto them. Many only went to Libya to use the country as a staging post to try and get into Europe. This was an illusion, for some were imprisoned for entering Libya illegally, while even those who succeeded in leaving Libya, sometimes perished in unsafe boats on which smugglers were trying to get them into Italy. Life in Italy for those who did not drown in the sea, turned out to be equally hazardous, as the inhuman treatment of the migrants by the Italian police began to be regarded by humanitarian organisations as one of the worst scandals in Italian politics. Col. Gaddafi himself laid the groundwork for anti-black prejudice in Libya when, in January 2008, his government announced plans to deport black migrants en masse. This was a sign of the Colonel’s inability to see reality, for at the same time, he was trying to get himself recognised as Africa’s “king of kings”. It took Human Rights Watch to point out to him that the mooted mass deportations were “illegal” under Libya’s own laws. 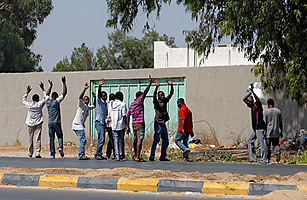 Libya’s deportation of black Africans in earlier years (6,027 Ghanaians were deported in 2004 alone) testified to the anti-black prejudice being a long-lasting problem. The irony is that as long ago as April 1958, “The Sahara unites us!” was the slogan of the first conference of independent African states called by President Kwame Nkrumah of Ghana in Accra to cement relations between Africa’s black south and Arab north. That fifty-three years later, the Sahara, far from uniting black Africans and their Arab brothers, is as divisive as ever, is one of the tragedies that the continent must face squarely and eliminate.